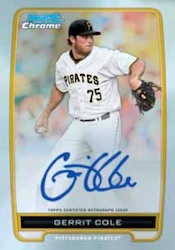 Releasing in early May, 2012 Bowman hobby boxes promise one Bowman Chrome Prospect Autograph. They also come in several levels of Refractor parallels. trying to put together the complete 2012 Bowman Chrome Prospects but struggling with the “official” auto list. Becketts shows a number of autos starting with #BCA in their list of 2012 Bowman Chrome Prospects cards. what is correct the BCA autos or just the BCP autos?